Move over kombucha, shrubs and switchels are this season's perfect fermented bevvie! Both drinks rely on using raw vinegar as their pre-fermented base and add an additional sweetener to the vinegar to continue the ferment process. This adds more probiotic benefit and creates a fizzy drink. Since shrubs and switchels use a fermented vinegar base, they're incredibly easy to make and perfect for first-time fermenters. With a short fermentation time and lots of ways to serve them, there's no reason not to try these recipes this Fall! Shrubs are drinking vinegars usually made with berries, sugar and fruit vinegar. Left to ferment for a few days, the bacteria and yeasts in the vinegar ferment the sugar to create a fizzy probiotic 'soda'. 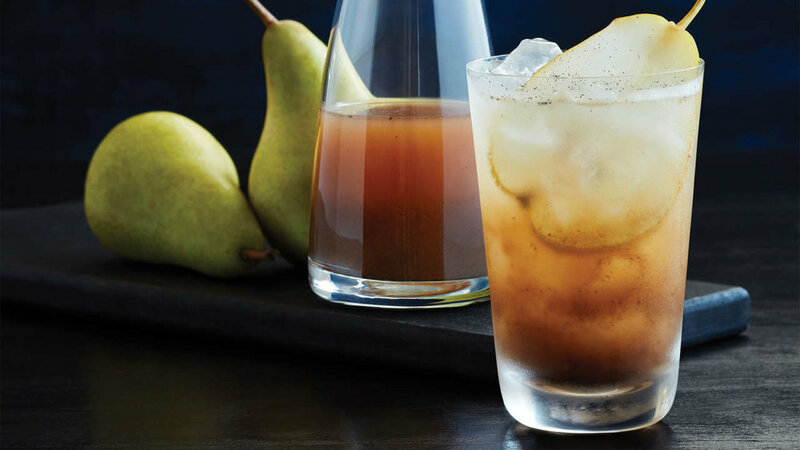 In this recipe, we infuse chopped pear, ginger and vanilla, creating a warm Fall flavour. You can serve the shrub like a tea, adding hot water before serving, or you can add sparkling water for a refreshing drink. It's probably also pretty amazing with bourbon or rum, but I'll leave that to you! Find the recipe here. Switchels traditionally use raw ginger and apple cider vinegar as their base and add maple syrup or honey for sweetness. Having raw apple cider vinegar before a meal can help enhance digestion and prevent bloating and gas. However, not everyone enjoys the taste of vinegar! In this recipe, we further enhance the digestive benefits of the switchel by adding fresh lemon, ginger and mint which also gives it a delicious flavour. You can have a small cup of switchel before a meal to prevent indigestion or enjoy a glass as a tasty, fermented 'electrolyte' drink after a workout. Find the recipe here.